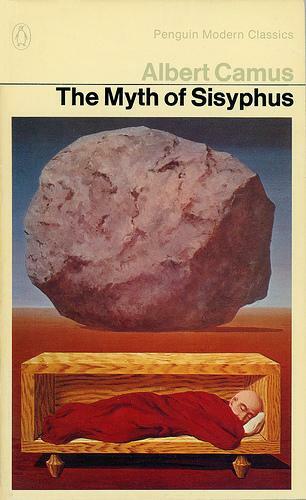 In The Myth Of Sisyphus, Albert Camus gets to the nub of it immediately, as he explains in the preface: "It is legitimate and necessary to wonder whether life has a meaning; therefore it is legitimate to meet the problem of suicide face to face. The answer, underlying and appearing through the paradoxes which cover it, is this: even if one does not believe in God, suicide is not legitimate. ...The Myth Of Sisyphus... sums itself up... as a lucid invitation to live and to create, in the very midst of the desert." For Camus, the plight of Sisyphus as relayed by Homer sums up the plight of human existence. Sisyphus was condemned by the gods to ceaselessly roll a rock to the top of a mountain whereupon the rock would roll back down again, forcing Sisyphus to start all over again. Over and over, again and again, on and on, forever and ever, Amen. Sisyphus, however, is being punished for loving life, hating death and scorning the gods (so in this light he may be viewed as a hero) and for such crimes the gods thought futile and hopeless labour would be the most dreadful of punishments. According to Camus, however, Sisyphus is undefeated and it's during his descent back down the mountain to the rock below to start the rolling again that he becomes aware of his loss of life on the earth, his condemnation to the underworld, and of his fate. It is in that hour that Sisyphus is conscious. Sisyphus is the proletarian of the gods. Powerless, rebellious but conscious of the whole extent of his wretched condition. He teaches us "the higher fidelity that negates the gods and raises rocks... The struggle itself towards the heights is enough to fill a man's heart. One must imagine Sisyphus happy." I wouldn't particularly urge anyone to read this book of Camus' above any other of his works but rather to view it as part of his canon, his oeuvre. If we have the luxury to do this in this day and age then why shouldn't we? The Myth Of Sisyphus describes the question of suicide in an absurd world but is incredibly life-affirming and not depressing in the slightest. Camus' message is a positive one: "Any authentic creation is a gift to the future".